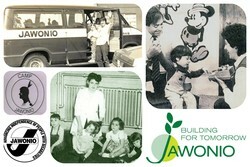 “Jawonio” is a Native American word that means “independence.” Founded in Rockland County in 1947 as the Rockland County Center for the Physically Handicapped & United Cerebral Palsy, Jawonio today is in the forefront of providing services that help people of all ages with special needs reach their potential and achieve independence. With the agency poised for new growth, this special exhibition highlights Jawonio’s seven decades of history advocating for and advancing equal rights for people with disabilities and special needs both within the Rockland community and throughout the Hudson Valley region. The exhibition runs from April 15-October 28, 2018, and is open to the public, free of charge, on Wednesdays-Fridays and Sundays, 1-4 pm, and by appointment. "Jawonio: Moving Forward, Looking Back" is a cooperative project of the Historical Society of Rockland County and the Jawonio Foundation. The HSRC receives operating support from the Office of the Rockland County Executive and the Rockland County Legislature. We are grateful for their support. Special thanks to Jawonio staff members Diana Hess, Chief Development Officer; Irene Goldstein, Development Associate/Fundraising Coordinator; Molly Gibeau-Griffin, Foundation Manager; Dana Ferraro, Communications and Development Coordinator,and Jill Warner, Executive Director; and to HSRC staff members and exhibition curators and volunteers: Richard Anderson, Bob Carroll, Susan Deeks, Christine Kowalski, Marianne Leese, Jennifer Plick, Clare Sheridan, and Caroline Tapley. For information about the exhibition or to schedule a group visit, contact Christine Kowalski, Museum Services Assistant, at (845) 634-9629 or memberservices@rocklandhistory.org.